This is the start page for the ModelGUI developer manual. The proposed beta release (1.0.0-beta) for the mgui project is early 2015. This manual will (in theory) be updated to provide support for the latest release. However, as a general policy all user manual entries will specify the release version for which they were written or updated. The "developer manual" series is intended for developers of the ModelGUI code. End users should refer to the "user manual". 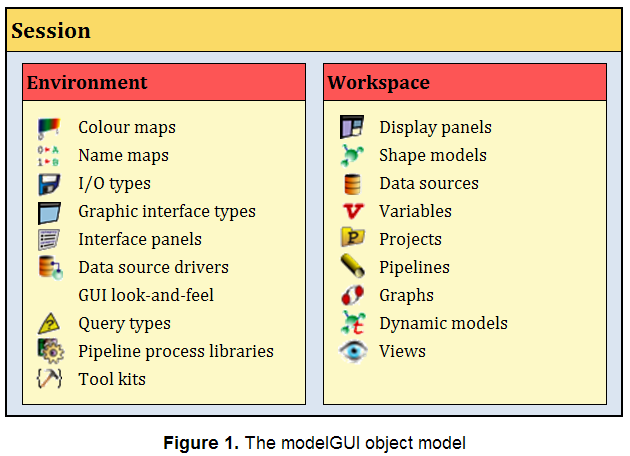 This manual describes the various Java objects which comprise the object model of ModelGUI, and the various semantics underlying these objects. This includes the inheritance structure, the listener models, the initialization routines, and the package organization. The manual attempts to discuss all the relevant details required to work with and extend the ModelGUI project, and to describe the various standards for I/O, GUI functionality, utility classes, resources, etc. ModelGUI is, in a nutshell, a project intended to implement a generic API for visualizing and processing scientific models, including geometric models and dynamic models. It is also intended to provide implementations for more specialized applications of the generic framework. In this sense, there is no limit to the intended scope of this project, nor is there an intended endpoint. In other words, while individual milestones will specify the direction of the project at any given time, the underlying concept of ModelGUI is to constantly evolve its functionality according to the needs of its contributor base. As an mgui developer, you are invited to participate in this evolution. ..where args is an array of String arguments, typically passed to a main function. Currently, args will either be empty, or contain one argument, which is the name of the initialization file ("init file") to use; this file must be contained in mgui's "init" subfolder. If no argument is specified this defaults to "mgui.model.init". Init files specify how a session and its environment is to be set up at start-up, by specifying a list of simple commands. They are described in detail here. Bazaar is a type of version control system, which streamlines the process of sharing a large number of text files (such as source code) between a community of developers who are making concurrent changes to them. Launchpad is a website which provides free hosting of open source code based upon Bazaar, and an excellent online interface through which a software project can be organized, and includes functionality for new development proposals, delegation of tasks to members, bug reports and fixes, and software releases and downloads. Launchpad and Bazaar together provide a very powerful platform for small projects (as ModelGUI currently is), and are perfectly scalable to large projects (which ModelGUI may eventually become). For instance, Launchpad currently hosts both the Ubuntu project and the MySQL database server. ModelGUI uses Launchpad to organize its community process. Thus, if you want to join the project, you can do so by becoming a member of Launchpad and being added as a member of the ModelGUI project. This framework allows you to immediately start contributing new ideas or implementations. For details on this process go here. Because ModelGUI is an open source community process, we have defined a number of coding standards which should be followed when developing the project. Following these standards provides code readability, allows for efficient API documentation, and facilitates the interpretation and extension of code by a community of developers. These standards are described in detail here. A list of the currently available tutorials is available here. ModelGUI is built on the Java Foundation Classes (JFC), a.k.a. Swing, GUI engine. This means that all of its windows, panels, and controls are extensions of Swing components, and its event handling is based upon JFC's Event Dispatch Thread. We recommend developers who are not acquainted with Swing check out the excellent tutorials provided by Oracle. This page is a good starting point. IDEs can also include plugins for checking out and committing code to/from revision control software repositories. ModelGUI is hosted on Launchpad, which is build on the Bazaar versioning system. Plugins exist for Eclipse but currently not for NetBeans. However, Bazaar works quite well as a stand-alone tool, so this is not a critical feature for ModelGUI developers — thus, either IDE should be suitable for ModelGUI development. Sessions represent the current execution instance of ModelGUI. These are implemented as the static class InterfaceSession. An Environment specifies all the capabilities and property settings of the current Session. This includes all of its I/O types (see below), its data source drivers, its colour maps, etc. On start up, the Session will load the Environment from a specific ".init" file, specified as a command line argument. If this argument is not specified, a default file is used. Environments are implemented as the static class InterfaceEnvironment. Workspaces are the top-level container for transient model objects in the Session. This includes shape models, data sources, graphs, plots, and windows. Workspaces are implemented as the class InterfaceWorkspace. An interface object represents a semantic link between the underlying data and the user. All objects in ModelGUI implement this Java interface, which provides a basic set of functions for user-data interactions. Note the semantic difference between "interface" in the mgui sense (i.e., a high-level concept indicating user interaction), and "interface" in the Java sense (i.e., a low-level construct defining a specification which all inheriting classes must implement). Since the idea of an interface is basic to the ModelGUI concept, we have not invented a new term; the downside, of course, is some ambiguity over what the term is referring to. This is important to bear in mind when documenting or describing mgui code. A set of attributes which determine how a shape is to be rendered in 2D and 3D. Also specify a method called attributeUpdated through which to respond to changes in a ShapeInt's attributes. Attributes are implemented by the Attribute class, and attribute sets are represented by the AttributeList class. Specify a method for issuing tree nodes, which include an attribute node, and which can be inserted into an object tree. Shape tree nodes are implemented by the ShapeTreeNode class. Maintain a list of ShapeListener objects, which implement a method called shapeUpdated, allowing these objects to respond to modifications to a shape. Allow the association of primitive values (instances of MguiNumber) with a shape's vertices. The abstract class InterfaceShape is the base implementation of interface shapes. It currently has two subclasses: Shape2DInt and Shape3DInt. Shape sets are collections of interface shapes. The interface ShapeSet is the basic interface for all shape sets. Tree nodes allow an interface object to be represented as a node on a tree graph, and provide an interface for changing attributes, copying, cutting, pasting, moving, and drag-and-dropping. The class InterfaceTreeNode is the basic implementation of all tree nodes. Provide complementarity between input and output operations. That is, for each input operation that loads data from persistent memory, there is a complementary output operation, which puts the identical data back into persistent memory. The I/O interface is specified by the Java interface InterfaceIO. The two major subclasses of this interface are FileWriter and FileLoader. Instances of I/O operations are specified by the user's Environment. This specification includes the extensions associated with the operation, and the specific implementations of InterfaceIO which perform the operation. This specification is implemented in mgui by the class InterfaceIOType.